ModMyi reports that it has received a purported internal AT&T memo from a source revealing that the carrier will only be taking pre-orders for black iPhone 4 models, with white models not set to become available until "later this summer". 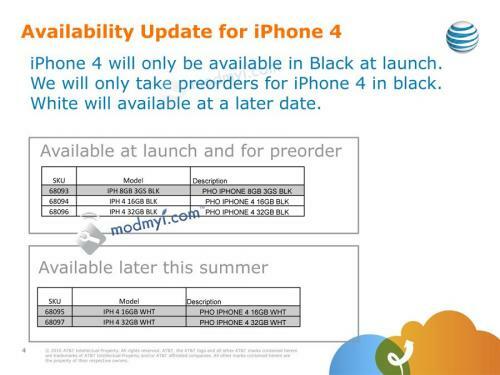 Apparently (see above image emailed to AT&T employees) the iPhone 4 will ONLY be available in black for pre-orders and launch. The initial lineup will be the 3G[S] in 8GB, and the black iPhone 4 at 16GB and 32GB. The white 16GB and 32GB iPhone 4 will be available "later this summer." It is unclear whether such restrictions would apply only to AT&T distribution or if it is a broader issue that will result in a delay of the sale of white iPhone models from Apple and other distribution points. No reason is given for the delay. Apple is set to begin taking pre-orders for iPhone 4 tomorrow morning, but has not specified when its site will go live to accept sales. Update: German site Macerkopf.de is reporting that Deutsche Telecom will also only be offering iPhone 4 in black at launch.